Casa Lella is in the province of Pesaro Urbino. It forms part of a farmhouse complex in 40 hectares of grounds. The complex is in a beautiful hilly area near the Adriatic coast, between the Foglia and Metauro valleys. The area has woods, olive groves, vineyards, hamlets, monasteries and fine old villas. The farmhouse complex consists of two spacious holiday homes which are opposite one another. Casa Lella was built in 1883 and has been attractively renovated by its owner. The seaside is 18 km away and you'll find a number of traditional mountain villages only 25 km away. You can visit famous art cities such as Urbino, Gubbio, Arezzo and Perugia and well known seaside resorts such as Cattolica and Rimini. 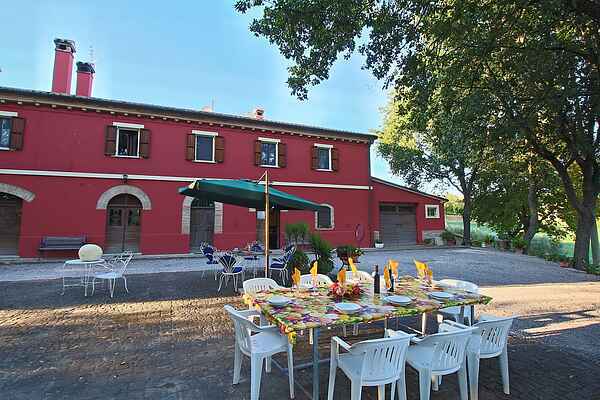 The owner will organise a wine tasting session or a visit to an olive oil press on request. He will also arrange visits to other traditional makers of local produce.